Why Should We Use Herbs And Spices In Cooking? Herbs and Spices enhance the flavour of our food and may decrease the amount of salt, fat and sugar without sacrificing the taste. Every cook needs a well-stocked spice cabinet, no matter your level of culinary expertise. Never buy a spice rack with spices in it! Chances are they are not fresh, and there might be ones you won’t use. Choose the spices you desire and look for expiration dates. I use only organic, certified gluten-free spices in my recipes because they are gluten free and make a big difference in flavour and have greater health benefits. 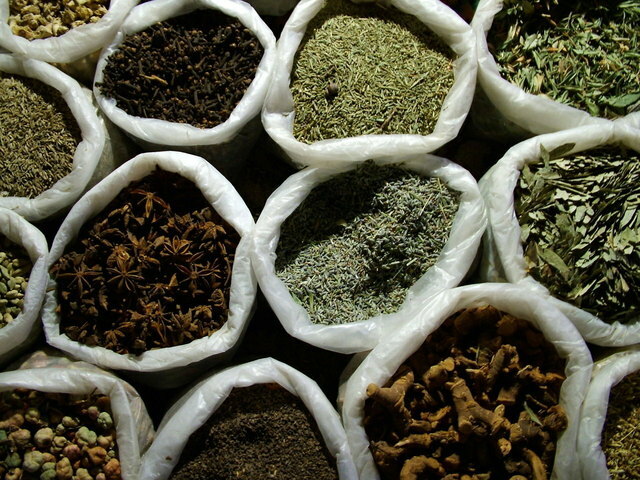 Spices come from the seeds, berries, bark, or roots of plants and herbs. It is important to know which combination of spices will best enhance the flavour in your food to create delicious recipes. To store your spices seal tightly in glass containers, and store in the dark. Cinnamon ~ Antioxidants in cinnamon have been linked to lower inflammation, as well as reductions in blood glucose concentrations in people with diabetes. Cardamom ~ Cardamom is used in alternative medicine to remove toxins. Oregano ~ Oregano is rich in vitamin K, has anti-bacterial properties and is high in antioxidants. Cayenne ~ Capsicum, the active ingredient in cayenne pepper, has been shown to increase circulation and contribute to weight loss. Cumin ~ Traditionally, cumin was added to foods to aid in digestion and the absorption of nutrients. Recently, cumin has been shown to have antibacterial qualities, especially associated with the digestive tract. Thyme ~ Thyme herb contains thymol, one of the important essential oils, which scientifically has been found to have antiseptic, anti-fungal characteristics. Rosemary ~ The most important part of rosemary is caffeic acid and its derivatives such as rosmarinic acid. Rosmarinic acid has some interesting biological activities, for example, it has antiviral, antibacterial, anti-inflammatory and antioxidant properties. Ginger ~ Ginger helps with nausea and upset stomach, especially associated with pregnancy. It has also shown anti-inflammatory properties. Cilantro ~ Cilantro is most often cited as being effective for toxic metal cleansing, the chemical compounds in cilantro bind to toxic metals and loosen them from the tissue. Parsley ~ Parsley is a nutritional powerhouse with vitamins A, B, C and K and the minerals iron and potassium. Basil ~ Basil reduces swelling and inflammation and is rich in antioxidants. You’ll enjoy cooking a lot more once you’ve mastered the herb and spice basics. The food will taste better, smell better, and will add many health benefits. Using a little spice can make the most basic recipes taste new and exciting. It is important to add fresh herbs near the end of cooking for more distinct flavour.